Marine aquaculture facilities can suffer severe predation from seals. Underwater aversive audible acoustic devices known as Acoustic Deterrent Devices (ADDs), intended to provide protection by deterring seal approach, are used commonly worldwide. Scottish fish farm. © OSC 2003. Ocean Science Consulting provides a range of ADDs in the form of low power pingers, or higher-powered seal scarers. If your facility is equipped already with ADDs, OSC can provide cost-effective advice to suit your budget, and/or experimental trials (including underwater modelling) to test your devices’ efficacy (see below). Our trailerable vessel, MV Orca, can be mobilised anywhere in Europe, and is only two hours away from the nearest fish farms on the west coast of Scotland. On behalf of clients, OSC has undertaken investigations into sounds made by active ADDs from fish farms. Typically, measurements of Source Level (SL) and power spectra are carried out on commercial ADDs used on salmonid fish farms. Signalling methods tend to differ considerably, and while fundamental acoustic frequencies (including harmonics) are usually similar, energy distribution often varies substantially. Propagation and Transmission Loss (TL) models in different sea states can be used to estimate potential distances at which marine mammals, such as seals, or harbour porpoises (Phocoena phocoena) can potentially detect ADDs. Other simulations can also be carried out to investigate sound propagation and TL at particular frequencies by submitting sound profiles measured under oceanographical/bathymetric conditions observed, which vary from location to location. 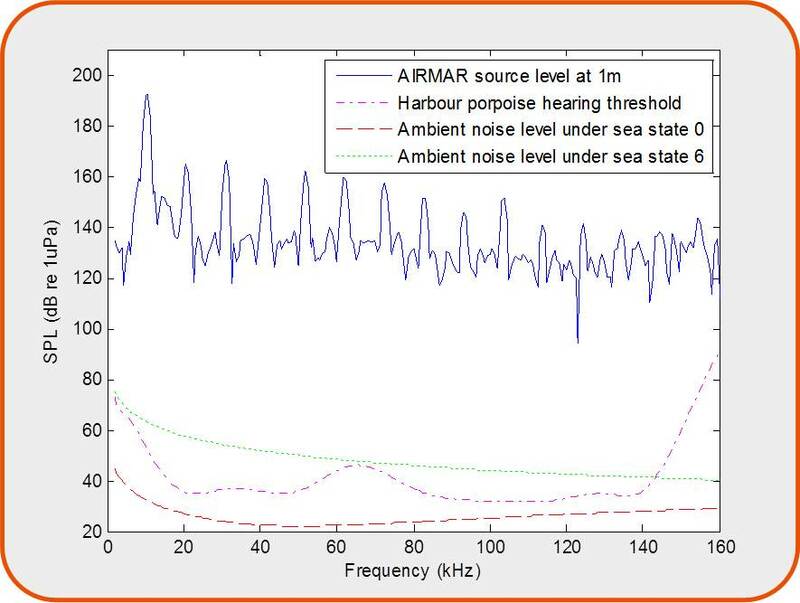 Sound Pressure Level (SPL) of an Acoustic Deterrent Device (ADD) at 1 m from the source (solid line), Hearing threshold of harbour porpoise (Phocoena phocoena; dash-dot line), ambient noise levels under sea state 0 (dashed line) and sea state 6 (dotted line).